There have been Baptist churches in Croatia since the 1890s. Over the last 20-30 years the Croatian Baptist Union has doubled in size and the number of congregations in still increasing. At present there are 1,900 church members attending a total of 50 churches and mission stations. The size of what could be termed the ‘Baptist community’ is likely to be two or three times this size (when family members and children of officially registered ‘members’ are taken into consideration). The Baptist Union currently has a church planting goal of seeing one Baptist congregation planted in every one of Croatia’s 21 counties. The European Baptist Federation’s Indigenous Mission Project reports on the work of a church planter in Novi Marof, about 100km from the capital, Zagreb. Twenty people are meeting regularly there for prayer and worship. ‘The meetings take place in a rented hall and are led by indigenous church planter Jonatan. The group has been meeting there for about one year and a good deal of growth has been notified since. There are counseling sessions twice a week in the same hall where the group meets for a Bible study on Friday night. People can come to talk or find advice about some spiritual or practical issues. Jonatan says: ‘There are only two reasons that prompt me to plant a church in Novi Marof: the Great Commission and God’s love towards lost people who need to be saved. The target group is especially the young people burdened with various problems (addictions, unemployment, depression etc). In order to accomplish this goal we have started the Christian counseling. This ministry serves all who need advice and encouragement, and who seek the true meaning of life.’ Jonatan is married to Daniela and they have two small children. A new Danish Bible version completed in 2007 has just been revised (as ‘The New Agreement’) in response to Google search engine returns for a range of religious words. According to the Danish Bible Society, if you type ‘sin’ or ‘sinner’ (synd/synder) into the Danish version of Google you get a range of hits that refer to the environment, football, education. Hits that refer to orthodox Christian understandings fall some way down the rankings. The New Agreement is available on Facebook and Twitter and features over 1,500 revisions made following internet research. Very likely the first Russian-language book dealing with Baptist life in the once-German Soviet enclave of Kaliningrad (German East Prussia) after 1945 appeared recently. Its author is Anatoly Krikun, the current Baptist Bishop (called “Starshy Presbyter”) of Kaliningrad/Königsberg. Publisher is the “Russian Union of Evangelical Christians-Baptists”’ “Moscow Theological Seminary”. The book is part of the Bishop’s work on a Master’s degree. 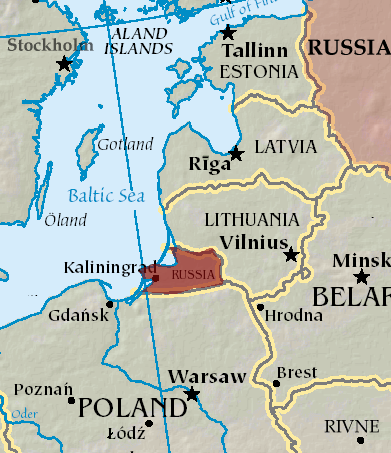 Intended to be a model zone for the socialist experiment, the newly-annexed region of Kaliningrad was to be denied any visible church life. Yet Krikun makes clear that despite persecution, church life on this once German turf never did disappear. The initial two-thirds of the book describes the German period up until 1945 and offers nothing new of substance to the German-language reader. But the description of the Soviet period from a Russian Baptist perspective indeed does break new ground. But the booklet’s title is confusing: “History of the Evangelical Christians-Baptists in East Prussia and Kaliningrad Region” (Istoria evangeliskikh khristian-baptistow w Wostotschnoi Prussi i Kaliningradskoi oblasti). German East Prussia never did sport a Russian Evangelical Christian-Baptist congregation. In no way does the author gloss over the existential hardships and vandalism of some Soviet citizens during the initial years. Hunger occurred not only in the Russian “motherland” immediately after the War. Krikun notes that 51% of the settlers who arrived during the period from 1948 to 1953 chose not to stay. Being that only 7.000 new settlers had arrived by November 1945 and more than 100.000 Germans remained, church life was very much in hands of Germans until their final deportion. Without regard for anyone’s denominational loyalties, Germans and Soviet citizens gathered at first under the spiritual leadership of Germans to worship. German clerics were highly-respected: “Generally speaking, relations between the two groups were positive.” (p. 81). The lack of any Orthodox church structures made it particularly easy for Baptists to evangelise on their own terms. In Kaliningrad, a 60-member Baptist congregation headed by the German pastor Heinrich Fenner was granted state registration in 1947. Yet that congregation did not survive the deportation of the final Germans. Baptist settlers first appear in the Soviet archives from 1947. The departure of the final Germans a year later nearly rang down the curtain on church life. That indeed appeared to occur among the Lutherans. Krikun does not mention that anyone wanting to attend a Lutheran service in the four decades after 1948 needed to travel to Lithuania. The Lutheran church in Silute (Heydekrug) in the Memel border region never was shut down by the Soviet authorities. The arrival of ever-new settlers from Western Russia, the Ukraine and Belarus repeatedly restocked the meagre Baptist ranks. In March 1947, the double-amputated preacher M. P. Reitusky arrived from Zaporozhe in Ukaine. Until 1954, he served as the leading Baptist clergyman for the entire region. In 1950, his Kaliningrad congregation had 40 members; 30 more attended one in Chernyakhovsk (Insterburg). Other house fellowships were located in Gusev (Gumbinnen) and Sovietsk (Tilsit). One-hundred-thirty of the faithful attended a feast in 1961; Krikun reports on 70 “activists” at that time. Beginning in 1964, ethnic German families from Kyrgyzstan with abundant numbers of children began to arrive. The arrival of these Germans furnished the Baptist movement with its first heyday lasting from 1976 until about 1989. Pavel Meissner already arrived from Kyrgyzstan in 1963; he headed the Baptist church of the region from 1965 until his emigration to Germany in 1976. In the years from 1966 until 1976, the Kaliningrad congegation usually gathered for worship at his house in the village of Pervomaiskaya near the former Bladiau far to the south of Kaliningrad. Thirty-percent of the region’s Baptists were of German ethnicity in the mid-70s – a fact which heightened the suspicions of state authorities. Krikun reports that government pressures forced Meisser to emigrate – his departure was followed by a wave of Germany-bound emigration. Today, only a tiny handful of ethnic Germans remain. In 1976, just before that initial exodus, the Kaliningrad congregation had 220 members. Baptist church life did not remain free of divisions and strife. Pentecostals began to arrive from Western Belarus in 1951. After worshiping together for a year, Pentecostals decided to go their own way – taking a number of Baptist families with them. The primary issue of content was speaking in tongues. Yet the church was able to regain its footing and decided to ordain two additional men in 1965. New members were in need of additional care. Yet Moscow’s All-Union Council of Baptists refused to ordain, citing the fact that the Kaliningrad congregation remained unregistered. Church leadership therefore approached a non-registered congregation of the “Initiativniki” in Brest/Belarus. During the visit of a small delegation from Brest in Kaliningrad, the guests made clear they would only be of assistance if the Kaliningrad group halted all cooperation with the USSR’s registered churches. The hosts decided not to accept the offer; unauthorized ordinations without outside sanction followed. One other result of these contacts was the formation of a group of “Initiativniki” in Kaliningrad. The Master’s thesis of the Russian-German Alex Breitkreuz, which appeared in 2006, states that this unregistered group had a respectable membership of 300 in 2004. Since the region’s congregations were unregistered and consequently illegal, it was impossible for them to open chapels of worship. All attempts after 1948 to achieve legality were repulsed. Yet a dramatic breakthrough occurred in May 1967: The Baptists were legally registered as the region’s first religious group. That can be seen on the webpage of Kaliningrad’s Baptist church („mir-kld.ru“). Yet Krikun writes in his book that Baptists were only “one of the first religious organisations” registered within the region. (p. 106) Significant in any case is the fact that this registration occurred long before registration of the Orthodox, which did not occur until April 1985. The Catholics and Lutherans were registered there in 1991. Closely tied to registration issues was the matter of real estate. Only on the third try was it possible to dedicate with major festivities a small, brand-new house of prayer on 12 August 1979. It was located at Krylova Street 38 on the northern edge of Kaliningrad far removed from any means of public transportation. Even the region’s Secretary for Religious Affairs, Y. Y. Makhobaisky attended. A trusting relationship had developed between him and the church. Krikun describes Makhobaisky as an “honest and intelligent person”. “When it was called for, he would defend the rights of the believers.” (p. 114) The very early registration of the Baptists was very likely due to this special relationship. Private houses had been obtained in 1965 and 1973 with the intention of remaking them into houses of worship. In the first case, the house was quickly confiscated by the state. In the second instance, after many months of official foot-dragging, the nearly completed building was torched by supposed arsons and leveled in 1975. Following Messner’s departure in 1976, the chauffeur Viktor Shumeyev was appointed “Senior Pastor”. He had arrived in the region as a 10-year-old with his parents in 1950 from Belgorod region in Western Russia. He retired as a pastor in January of this year. The 1946-born engineer Anatoly Krikun hails from Berdichev in Zhitomir region not far from Kiev, where his father Ivan had served as a lay minister. He arrived in Kaliningrad region in 1967 and replaced Shumeyev as Church Secretary in 1973. Krikun was ordained a deacon in 1993 and became a pastor a year later. He was officially named the Senior Pastor (Bishop) in 1996. Krikun’s book suddenly ends with 1985 and Mikhail Gorbachev’s ascent to power. Krikun’s own naming as Senior Pastor is not mentioned. Also unmentioned is his congregation’s move to an impressive new structure at Gagarina Street 18 in the east of the city. A church centre with space for 500 worshippers was dedicated there on 23 August 1998. The event’s 700 guests included 100 from Germany. The Germans contributed most of the funding (500.000 German marks) for the building of the structure – many donors had been residents of long-gone Eastern Prussia. Breitkreuz reports that this Kaliningrad congregation had a membership of 318 in 2004; the entire enclave had 426 registered Baptists. Church life has remained stable; in 1999 a “Bible college” now enjoying state recognition was opened. That institution relates to the Germany “Bible Seminary Bonn”, which is run by German emigres from Russia. This press release of the Russian Evangelical Alliance is informational in character and does not express a sole, official position of Alliance leadership. UK missionaries in Europe: do they make sense? Language skills remain an essential skill for effective cross-cultural mission. The British abroad take not just their own language but a very nuanced sense of meanings shrouded in their subtle use of the English language. 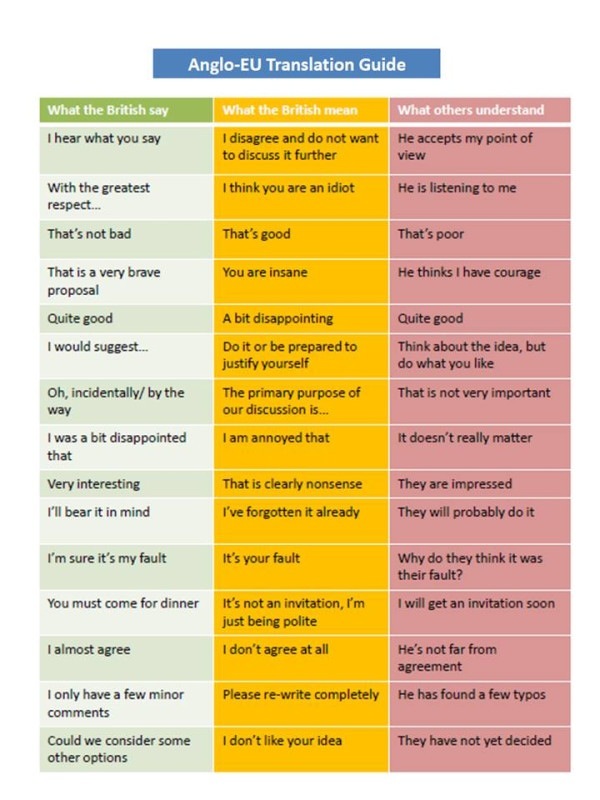 For non-British speakers of English, this guide to Anglo-EU communication may be useful. It’s been circulating the blogosphere recently so I’m not sure of its origin. Enjoy! ‘City to City – Europe‘ describes itself as a growing network of church plants and pastors throughout Europe with an annual meeting. The next meeting of the network takes place in Berlin between the 25-27th October, 2011 at the ‘Gospel and the City’ Conference. Network members are working in major European cities, represent various denominations and minister in different urban contexts. The network values an approach to effective urban ministry that applies the gospel to every aspect of life and church ministry and believes that church planting needs to be thoroughly contextualised. 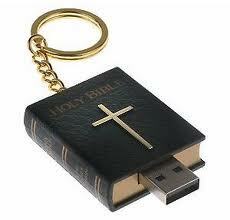 It appreciates secular culture while maintaining the historic confessions of the Christian faith. The network draws inspiration from the practical example of Redeemer Presbyterian Church and the teaching of Timothy Keller, founding pastor of this church. The 2011 Conference is being opened up more widely and will include important input from European speakers including Dr. Stefan Paas of the Netherlands who will offer a comparative evluation of the main differences between European and American church planting in the urban context. For further details of the event, or to follow links to the City to City site, check out our ‘Events’ pages.